Headaches inflict their misery in a variety of ways, from a dull, steady ache to a blinding, throbbing pain. Nearly everyone has them at least occasionally, but an unfortunate few experience near-constant head pain. This Special Health Report, Headaches: Preventing and treating migraines and other headaches, offers in-depth information on the most common kinds of headaches and the treatment strategies that work best for each, including a number of self-help and alternative techniques. Headaches inflict their misery in a variety of ways, from a dull, steady ache to a blinding, throbbing pain. Nearly everyone has them at least occasionally, but an unfortunate few experience near-constant head pain. Yet no matter how mild or severe your headaches are, many effective strategies relieve and even prevent headaches. 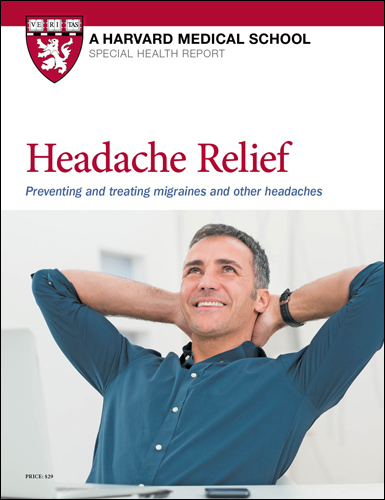 This report offers in-depth information on the most common kinds of headaches and the treatment strategies that work best for each, including a number of self-help and alternative techniques, such as acupuncture, which has garnered more credibility in recent years as a way to avert recurring headaches. This report also explores a variety of preventive strategies, such as using stress management, physical therapy, or exercise in tandem with medications. Another aspect of prevention is learning to recognize and change things that may trigger your headaches — for example, reducing emotional stress, changing your diet, or getting more sleep. Advances in the medical management of headache mean that relief is no longer just possible, but probable. Although some form of head pain will occasionally visit most people, no one should have to live and suffer with headaches. The headache would get worse until it was a smashing weight, sending red pain through his head and neck with every pulse beat. Bright lights would make his eyes water helplessly and send darts of agony into the flesh just behind his eyes. Small noises magnified, ordinary noises insupportable. The headache would worsen until it felt as if his head were being crushed inside an inquisitor's lovecap…. He would be next to helpless. King doesn't describe the pattern of the pain, but the word "migraine" itself tells you something about that. It is the French derivation of the Greek word hemikrania, meaning "half a head," since migraine pain usually affects only one side of the head, most often at the temple. Migraine pain ranges from moderate to severe, and the side of the head that's affected can vary from one attack to the next, or even during a single episode. Unlike tension headaches, migraines can keep you from functioning or sleeping, and they can even rouse you from sound slumber. Most people describe the pain as pulsating or throbbing. It can also be sharp, almost as if a dagger is piercing your temple or eye. Tense head, neck, and shoulder muscles can accompany a migraine headache. In fact, measurements of muscle tension tend to be higher in migraine sufferers than in people with tension headaches. In most cases, this is thought to be an involuntary response to the pain, rather than its cause, although tight muscles can also trigger a migraine headache. Bright lights and loud noises worsen the pain and may prompt someone with a migraine headache to seek out quiet, dimly lit places. Nausea and vomiting are common during a migraine; odors may aggravate these symptoms. People who suffer from frequent or even daily migraines (chronic migraines) also are more likely to have additional health concerns, such as anxiety, depression, insomnia, irritable bowel syndrome, or restless legs syndrome. Addressing these other problems — or comorbidities, as they’re known medically — is an important aspect of optimal migraine treatment.